The collapse of industrial civilization, well underway since at least 2007, presents humankind with unprecedented and daunting challenges in the area of energy, environment, and economics. 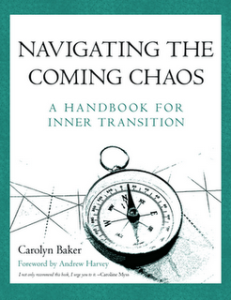 Just as the Transition Handbook of 2008, provided specific strategies for addressing these changes logistically, Navigating The Coming Chaos, provides a toolkit of emotional and spiritual preparation for an uncertain future. It offers us an opportunity to step across an evolutionary threshold in order to become a new kind of human being living in conscious self-awareness of our intimate connection with all life in the universe. Navigating the Coming Chaos is Carolyn Baker’s latest, and most important work. As we face up to the reality of collapse, the diff erence between those former citizens who cope and those who don’t may well be a simple case of who has taken heed of the lessons contained within these priceless pages.